SABLA Scheme aims at empowering Adolescent Girls of 11-18 years by improving their nutritional and health status,upgradation of home skills,life skills and vocational skills.The girls will be equipped with information on health and family welfare,hygiene and guidance on existing public services. 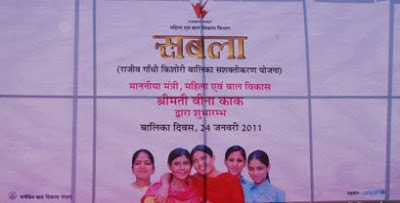 Rajiv Gandhi Scheme for Empowerment of Adolescent Girls is "Sabla" The scheme would be implemented using the platform of ICDS and AWCs would be the focal point for the delivery of services.However,where infrastructure and other facilities are inadequate in AWCs,then alternative arrangements will have to be made in schools/Panchayat Community buildings. The SABLA scheme on a pilot basis has been approved by GOI initially in 200 districts(all over India).These districts have been selected from all States/UTs on the basis of a composite index based on indicators relevant to the condition of Adolescent Girls across the country. vii. Vocational training for girls aged 16 and above under National Skill Development Program (NSDP).